Please allow me to preface this piece by saying that I am a father of two, and as a dad, I must say that drugs are bad and no one should ever do drugs unless they want a life of misery and poverty and pain. Over the course of my life, the drug scene (that’s what kids call it, right?) has changed A LOT. The arc of my relationship with drugs has gone from me proudly wearing my D.A.R.E. T-shirt in 4th grade, to ironically wearing a tattered D.A.R.E. shirt in my late teens, smoking weed and high on mushrooms (sorry, Mom). Things I never anticipated include: my kids walking by someone smoking weed and asking, “What’s that smell?” and “brieing”— middle-aged women in England wrapping ecstasy pills in soft cheese, then having a euphoric dinner party. This raises some questions. First, the practical: why the cheese, when the pill is literally the tiniest, easiest thing to ingest? 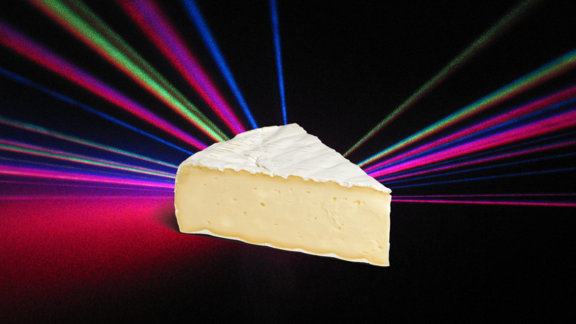 Second: what does one serve alongside a cheese platter at an ecstasy-fueled dinner party? Aside from like, lollipops, chewing gum, glitter and Vick’s VapoRub? And sure, these days, cannabis dinners are as common as crash sales on Mario Batali brand marinara, but it made me wonder what other illicit drug/culinary stalwart combos we’re not considering. Was this a one-off attempt to make brie, the cheese that has ruined a thousand Thanksgiving dinners, more interesting? Or is it perhaps an attempt to class up ecstasy, also known as the drug your cousin from Florida snorted in a Chick-Fil-A bathroom once? Acid & ice cream. This would work, right? Eating ice cream is pure joy, and would put you in the right headspace to fry your face off. It’s easy to eat, and if nothing else, a video of you smearing ice cream all over your face because you mistook it for sunscreen would go viral in minutes (at the expense of like, your dignity). Xanax & spicy food. Have you ever gotten home after eating a spicy meal and tried going to sleep, only to lay there, waiting for your stomach to melt from the heat building inside your chest? You were slow on taking that antacid, but this Xanax will put you to sleep for the next 10 hours. Congratulations on being very late to work tomorrow. Psychedelic mushrooms and…nothing. They’re disgusting and will make you feel like there’s a gremlin living inside your chest cavity. I tried putting them in a burrito once. First of all, mushrooms don’t belong in burritos. So, basically, I ruined a very fine burrito and then had a stomach ache that I was convinced was going to kill me for the next four hours. An afternoon with Bohemian Creamery's Lisa Gottreich. A well-intentioned, but unlikely-to-come-true request for the New Year.